A recent study by Ponemon showed that the likelihood of an enterprise data breach of involving more than 10,000 records is approximately 22%. This risk, with an average associated cost of $3.79 million, has catapulted cloud security into an executive and board level. What key metrics should you track and share with your board? How should you structure your cloud security strategy to best protect your organization? 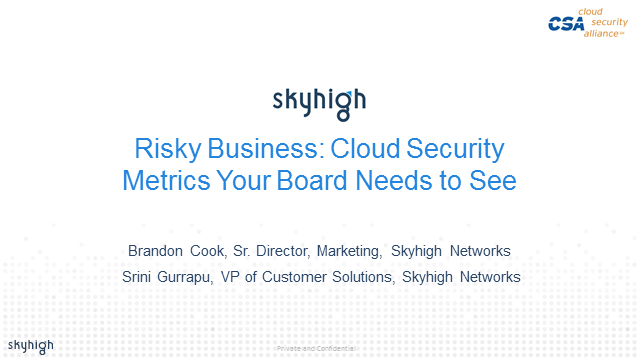 Join Skyhigh Networks and CSA for a discussion of best practices that leading enterprises have embraced for managing and communicating cloud risk with the board. Registrants will also receive a “Cloud Security and Governance Report for Executives and the Board” template to jump start the discussion. We look forward to seeing you at the webinar!